Everyone follows, especially leaders. You aren’t going very far if you aren’t following someone. 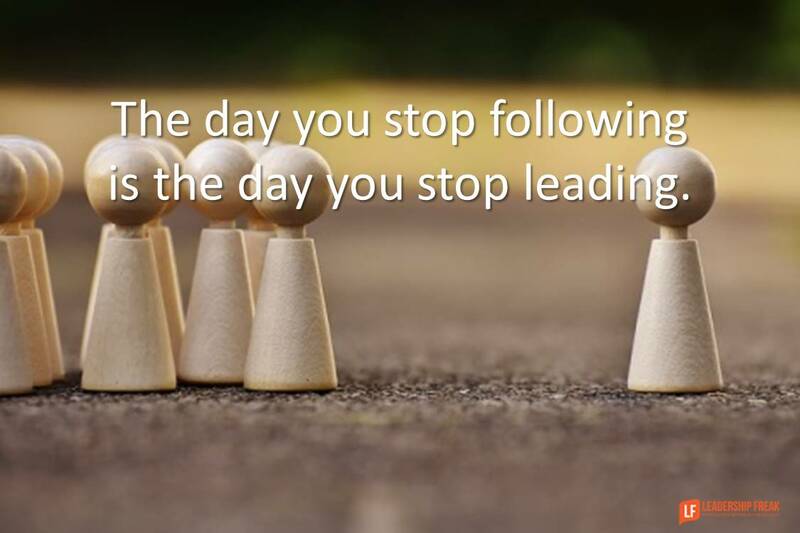 The day you stop following is the day you stop leading. Follow others in the same way you would like to be followed. Follow someone who presses into the future. Listen closely to the orientation of the people around you. People with experience may long for the past. Follow them at your peril. The person pressing into the future makes others uncomfortable. Future-builders don’t care about stability enough. The opportunity of disruption is letting go of the past. Tip: Disrupt yourself more than you disrupt others. Follow someone different from you. If you are older, follow someone younger. Some of the biggest changes in my life resulted from following the suggestions and passion of young people. Follow a different gender, race, or nationality. Follow someone from a different business sector. Don’t allow their frailties and limitations to be the reason you reject their insights or approach. Follow someone who’s frustrated about something. Determine if they want to do something with their frustration or just complain. Don’t follow complainers. How might you translate the energy of frustration into a positive force for change? Be enthusiastic about the ideas of others. Don’t spend so much time pushing your own ideas. Adapt to someone else’s way of thinking, without violating your own values. Try behaviors that others suggest, even when they feel awkward. The more uncomfortable a behavior feels, the greater it’s potential to change you. If you only do what’s comfortable, you’ll only go where you’ve been. Talk about things you’re learning. Reject the self-defeating need to appear like you already know. What does being a leader who follows look like to you? What potential advantages or dangers do you see in being a leader who follows? What potential advantages or dangers do you see in being a leader who follows? Advantages of following successful leaders promotes success if you learn by their development. Dangers develop when you/we become complacent without vision. Each leader need to convey what they see? how they see it? How they plan to enable what they see.? Vision requires others to see the entire picture, and the followers to buy in. Difficult to run the ship if all hands are not on deck!. “Disrupt yourself more than you disrupt others.” Great tip! I would add make sure you are getting out of your own head during a challenging conversation/situation and be curious about what is making you uncomfortable. Often an internal shift, though sometimes painful, leads to more interesting opportunities to grow as a person, learning something new and/or finding better solutions to problems. Encouragement and coming along side is so vital, simple, and sometimes under-practiced… love hearing, "I was about to give up on this when you… "
“If you only do what’s comfortable, you’ll only go where you’ve been.” In order to improve- in any facet of life one must get a little uncomfortable- that is how you know you’re alive! Thanks for the prod! Better yet, instead of inviting “followers”,invite others to see and invest themselves as stakeholders. For me this is a mindset that brings and invites mutual respect and it communicates that others have value, which in turn can lead to higher engagement. I just signed on to a group project – by choice, I do not see myself so much as a follower, but rather as a committed proactive stakeholder investing myself for the team and being and bringing the very best of me. (The leader inspired me.) Notice here that I am disrupting me – in my own thought process ( and sharing it with you) – especially in redefining the term ‘follower’ and role modeling it with commitment in action. But,isn’t that what leaders do? I am also rewarding the inspiring leader by bringing my energy to HIS – no – now, it is OUR project. Thank you for inviting the paradigm shift to see that a good follower can also be great leader. A paradox indeed! What you are describing is really a very healthy INTERDEPENDENT leader/follower model, and we surely need more of that in so many of our codependent organizations!! Thanks again – Happy New Year! Is sometimes following actually harmful when a natural leader ‘smallifies’ himself to the point that he stops leading? It could be that the younger one feels like he no longer needs to listen nor does he feel a need to have the voice of the older leader. Does that make sense? So the older leader learns to follow without giving too much unsolicited advice, but inside he is slowly dying because he is no longer a leader, but a follower. Thanks peter…. Perhaps the answer that addresses a concern for weakness is found in who one follows. Leaders often follow the advice of subject area experts, for example. That seems to elevate our confidence. On the other hand, leaders who pretends they know when they don’t are less trustworthy. Your comment demonstrates the importance of who we choose to follow. If you choose to follow a young leader who feels they don’t need to listen to others, you have made a poor choice.